Before the cold weather arrives and I turn to hearty stews, roasts, cassoulet and such, I'm getting in my late-summer/early-fall fish fixes. There are few things in life I like more than an über-fresh piece of fish and a crisp, clean glass of wine to go with it. However, fish can be a tricky food to pair with wine. Even many white wines—heavily oaked California Chardonnay, for example—can overpower a simple preparation of fish or shellfish. On the other hand, a piece of fish that is fried, heavily sauced or spicy might call for a wine with a bit more weight to it. With something like shrimp scampi or an oyster po'boy, for instance, I'd probably lean toward a ripe style of Chardonnay, but one that's not too oaky; Estancia, Silverado, Sonoma-Cutrer or Cakebread would be on my shortlist. But my favorite fish and seafood preparations are pretty simple: steamed shrimp, crab and lobster; grilled fish fillets; sushi; oysters on the half shell. For these types of straightforward fish and shellfish, I think the most versatile wine to accompany them is Sauvignon Blanc. Now, I know that fresh, ice-cold oysters and French Chablis are a classic food & wine match. But I do still like the crisp acidity and slight spiciness of Sauvignon Blanc with the aforementioned foods. I especially recommend oysters on the half shell with a glass of Sancerre from France. And there's a bonus when drinking Sauvignon Blanc: It tends to pair well with the salads and vegetables we like to eat alongside seafood—especially vinegary salads, artichokes and the notoriously wine-phobic asparagus. There's an herbal/vegetal component to Sauvignon Blanc that makes it a natural partner for vegetables. Indeed, there are certain varieties of Sauvignon Blanc that even taste like asparagus, although subtly so. With the exception of some heavy-handed California producers, Sauvignon Blanc is usually a very dry, starkly acidic white wine with little or no oak flavor, but lots of fruit. I usually tend to notice grapefruit, lime, peach and melon flavors in Sauvignon Blanc. Most of the best Sauvignon Blanc is aged in stainless steel tanks, but oak casks are increasingly being used. The clean, fresh, fruity taste of Sauvignon Blanc and its relatively light body and feel means that it will provide a quiet and restrained partner for simple grilled or sauteed scallops, chilled shrimp or crab, and even steamed or boiled lobster with drawn butter. The same is true of roasted and broiled fish. Even a routine piece of broiled halibut will perk up nicely with a squeeze of lemon, a sprinkling of fresh herbs and a glass of Sauvignon Blanc alongside. By the way, Sauvignon Blanc is a perfect match for goat cheese, as well. So, if you're serving Sauvignon Blanc with a seafood-based lunch or dinner, consider starting with a salad topped with goat cheese, or just a small piece of chevre alongside a few stalks of cold asparagus as an appetizer. Generally, when I refer to Sauvignon Blanc I'm thinking of the great wines from New Zealand, with their sharp citrus flavors. Cloudy Bay, Dog Point, Craggy Range, Kim Crawford, Villa Maria, Huia, Matua Valley, Giesen and Nautilus are all good representatives. I'm also fond of Montes Sauvignon Blanc from Chile. But don't overlook California. The brisk style of Sauvignon Blanc from California by producers like Cakebread, St. Supery, Joel Gott, Clos du Bois and Duckhorn have enough backbone and acidity to enjoy with oilier fish such as mackerel, bluefish, tuna and even salmon. 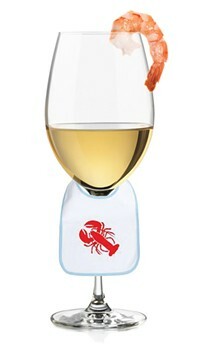 So when things start getting fishy, break out the Sauvignon Blanc.